Fiscal 50: State Trends and Analysis, an interactive resource from The Pew Charitable Trusts, allows you to sort and analyze data on key fiscal, economic, and demographic trends in the 50 states and understand their impact on states’ fiscal health. Read the key findings below. After years of slow progress, states benefited from a more promising economic and fiscal environment in 2018. Pressure on state finances eased somewhat as the second-longest economic recovery gained momentum and state tax revenue jumped, at least temporarily. Still, not all states have fully recovered from the shocks of the Great Recession more than a decade ago. Some are in a stronger position than others as they gauge how long the recovery will last. A surge in tax receipts provided budget relief for many states, though some of the extra money was due to short-lived effects from the federal Tax Cuts and Jobs Act. Tax collections in 41 states—the most yet—had surpassed their recession-era peaks by late 2018, after adjusting for inflation. The extra revenue led a number of states to add to their rainy day funds, which could cover a bigger share of spending than before the recession in at least half the states. Economically, employment rates and growth are on the upswing. Still, the estimated share of prime working-age adults with jobs was lower than before the recession in most states at the end of 2017, and growth measured by state personal income still lagged historic rates. Tax revenue. The strongest stretch of tax revenue growth in seven years extended into the third quarter of 2018, but at least some of the gains were temporary and are expected to fade in upcoming quarters. Overall, just nine states took in less tax revenue than before receipts plunged in the downturn, after accounting for inflation. State by state, the recovery has been uneven because of differences in economic conditions and tax policy choices. States with below-peak tax revenue still have less purchasing power than a decade earlier. Reserves and balances. States had more savings set aside at the end of fiscal 2018 to weather the next economic downturn than at any point since the 2007-09 recession. Nationwide, rainy day funds held a record amount of money, and at least 26 states’ savings exceeded pre-recession levels when measured as a share of operating costs. A tax revenue surge in fiscal 2018 helped 32 states expand their rainy day funds. Still, just over half of states were less financially equipped, counting rainy day funds plus leftover general fund dollars, to cover their costs than just before the recession. Employment-to-population ratio. The U.S. employment rate for adults of prime working age rose in 2017 for a seventh consecutive year, though no state could boast that its core labor pool had clearly surpassed its pre-recession employment rate. The share of prime-working-age adults (ages 25 to 54) with a job clearly remained below pre-recession levels nationally and in 10 states. Employment rates for this population were lower than in 2007 in another 30 states and higher in 10, but not by statistically significant amounts, so the results were inconclusive. State personal income. The second-longest U.S. economic recovery has played out unevenly across states. Growth has been strongest in North Dakota and a group of mostly Western states and weakest in Connecticut, as measured by the rate of change in each state’s total personal income since the start of the Great Recession. State personal income growth—a measure of the economy—has trailed its historical pace. But for just the sixth time since the end of the downturn, all states posted gains from a year earlier in the third quarter of 2018. Even states that have overcome the effects of the recession may face financial and demographic pressures that could shape their budgets now and for years to come. A number of state governments face fiscal constraints today because of inherited shortfalls in funding for public employees’ pension and retiree health care benefits; recurring deficits between annual state revenue and expenses; and weak population growth, which can affect economic prospects and revenue collections. Among other challenges facing states are rising costs for Medicaid, a health care program that accounts for the largest share of total federal aid to states, and tax revenue volatility, which can confound policymakers’ efforts to balance budgets. Debt and unfunded retirement costs. Unfunded pension benefits were the largest, most prominent, and fastest-growing of a selection of future costs facing states as of 2013. States reported $968 billion in unfunded pension costs—the equivalent of 6.9 percent of 50-state personal income, as well as $587 billion in unfunded retiree health care liabilities (4.2 percent of personal income) and $518 billion in outstanding debt (3.7 percent). If not properly managed, these costs can limit future budget flexibility and raise borrowing costs. Fiscal balance. Even in the aftermath of two recessions, most states amassed sufficient revenue between fiscal years 2003 and 2017 to cover all their expenses. But total revenue in 10 states fell short, jeopardizing those states’ long-term fiscal flexibility and pushing off to future taxpayers some past costs for operating government and providing services. States can withstand periodic deficits without endangering their fiscal health over the long run. But chronic shortfalls are one indication of a more serious, unsustainable structural deficit in which revenue will continue to fall short of spending absent policy changes. State Medicaid spending. The share of states’ own money spent on Medicaid grew in every state between fiscal 2000 and 2016. States’ increases varied widely, however, from less than 1 cent to about 14 cents more per dollar of state-generated revenue, exerting different degrees of budget pressure. Medicaid’s claim on state revenue surged in the wake of the Great Recession, after temporary federal economic stimulus dollars expired but before the federally funded expansion of Medicaid eligibility began, and has remained stable since. Medicaid is most state governments’ second biggest expense, after K-12 education. Population change. All but two states—Illinois and West Virginia—added residents over the past decade, with those in the West and South growing fastest. Still, population growth is estimated to have slowed nationally and in most states over the past 10 years, continuing a long-term trend. In 2018 alone, nine states had fewer residents than a year earlier. Population changes are tied to states’ economic fortunes and government finances, and are therefore useful for understanding both. Federal share of state revenue. The federal government is the second-largest source of state revenue—accounting for 32.6 percent of the total in fiscal 2016—meaning that federal budget decisions also play a key role in state budgets. But states’ reliance on federal funds varies widely, ranging from about 21 percent of revenue in Virginia to more than 43 percent in Mississippi. The share of states’ revenue made up by federal dollars increased in fiscal 2016 to the third-largest on record, capturing the first and second full year of expanded Medicaid eligibility in some states. Tax revenue volatility. Some states experience greater swings in tax revenue from year to year than others do, leading to surprise shortfalls or windfalls that can make it hard to manage budgets. Alaska experienced the greatest volatility over the past two decades and South Dakota the least, after removing the effects of tax policy changes. Taxes on oil and mineral extraction and corporate income were consistently more volatile than other major tax streams. Click here for a printable version of this analysis. Compare states over time, with each other, or with national trends. Gain insights into each state’s long-term financial well-being. Read analysis from Pew experts. The primary objective of Fiscal 50 is to provide insights into states’ long-term fiscal health on a range of metrics. This tool is not meant to be a comprehensive assessment of a state’s finances or a replica of state budget statistics that are published by a variety of experts. Rather, Fiscal 50 selectively presents data and analyses that help states look beyond their current budgets, size up their progress over time, consider different ways to measure performance, and easily compare their outcomes with neighbors or peers that have similar resources and challenges. This resource will be updated regularly with more analysis, fresh data, and additional indicators. Fiscal 50 identifies five core areas that are essential to states’ fiscal health: revenue, spending, economy and people, long-term costs, and fiscal policy. Indicators for each of these are selected with states’ long-term financial well-being in mind. Pew solicited advice from outside fiscal experts in choosing them. Fiscal 50 builds on data from U.S. government agencies, the Nelson A. Rockefeller Institute of Government, the National Association of State Budget Officers, the National Governors Association, and Pew’s own research. Differences can be expected between certain fiscal data used in this analysis and data compiled and used by states for budgeting purposes. Statistics featured in Fiscal 50 are the best available for drawing fair comparisons across states. A decade after the start of the Great Recession, 34 states—the most yet—were taking in more tax revenue at the end of 2017 than before receipts plunged in the downturn, after accounting for inflation. Total state collections surged in the fourth quarter, but some of the spike was temporary as taxpayers rushed to take advantage of certain federal tax breaks set to be curtailed in 2018. Read more below. In the fourth quarter of 2017, state tax revenue collectively swelled to a new high of 9.1 percent above its 2008 peak during the recession, after adjusting for inflation and averaging across four quarters to smooth seasonal fluctuations. That was up from 7.2 percent in the previous quarter and among the largest jumps in quarterly tax revenue since the economic recovery began. After nearly two years of weak tax revenue growth, many states reported robust gains for the end of last year as Congress prepared to pass the Tax Cuts and Jobs Act. An unusually large number of states—15—saw revenue spike by at least 10 percent in the fourth quarter of 2017 compared with the same period a year earlier. Some growth was driven by taxpayer behavior, resulting in a one-time revenue bump. Taxpayers—especially high-income earners—had an incentive to accelerate the timing of payments to states before a long-standing tax break was cut back under the tax law passed last year. The federal deduction for state and local tax payments was capped at $10,000 beginning this year. But the growth spurt may be short-lived. States can expect weaker growth in the first quarter of 2018, according to the Nelson A. Rockefeller Institute of Government. Collections this year also face uncertainty from the effects of federal tax changes because income tax rules in most states are linked in some way to the federal tax code, and federal rule changes can affect states’ collections. As states come out of a period of exceptionally slow revenue growth, the volatile revenue pattern ahead poses a new challenge. The latest results mean that the 50 states combined had the equivalent of 9.1 cents more in purchasing power in the fourth quarter of 2017 for every $1 they collected at their peak in 2008. Total state tax revenue has rebounded more slowly after the 2007-09 recession than it did after any of the three previous downturns. But trends have varied widely by state. In nine of the 34 states in which collections had recovered from their recession losses by the fourth quarter of 2017, tax revenue—and thus purchasing power—was more than 15 percent higher than at its peak before or during the recession. Conversely, collections were down 15 percent or more in two of the 16 states in which tax revenue was still below peak. As states regain fiscal ground lost in the recession, policymakers face pressure to catch up on investments and spending postponed because of the downturn. That may be more difficult in states where tax revenue remains below its previous peak. But even a return to peak levels can leave states with little extra to make up for cuts in federal aid or to pay for costs associated with population increases, growth in Medicaid enrollment, deferred needs, and accumulated debts. Nine states posted tax revenue rebounds of 15 percent or more: North Dakota (31.6 percent), Oregon and Colorado (24.8 percent), Minnesota (24.1 percent), California (21.9 percent), Maryland (20.3 percent), Hawaii (20.2 percent), Nevada (18.9), and South Dakota (18.6 percent). North Dakota remained the leader among all states in tax revenue growth since the recession, although its collections have dropped dramatically since the 2014 plunge in oil prices. At the end of that year, receipts hit a high of 124.5 percent above their peak during the recession, compared with 31.6 percent above in the fourth quarter of 2017. Oregon and Colorado (24.8 percent) tied for second-highest growth since their recession-era peaks, but both have a constitutional cap on tax revenue growth, which could trigger a refund to taxpayers if strong gains persist over the remainder of the fiscal year. Alaska (-88.4 percent) was furthest below its peak. This means the state collected only about 12 percent as much in inflation-adjusted tax dollars as it did at its short-lived peak in 2008, when a new state oil tax coincided with record-high crude prices. Without personal income or general sales taxes, Alaska is highly dependent on oil-related severance tax revenue, which began falling even before worldwide crude prices declined in 2014 as its oil production waned. Just one additional state was down more than 15 percent from its previous peak: Wyoming (-36.4 percent). State tax collections rose sharply in the fourth quarter of 2017, which was halfway through most states’ 2018 budget year. All major tax streams recorded stronger gains, including sales taxes, which have consistently trailed the growth seen in past economic expansions. The largest gains were in personal income tax collections, in part because of taxpayer behavior in response to the federal tax changes passed at the end of the year. Additional gains in some states came from payments that hedge fund managers made on earnings required to be returned from offshore accounts by the end of last year, according to the Rockefeller Institute. Robust stock market growth throughout 2017 also contributed to income tax receipts’ strong performance, while rising energy prices benefited tax collections in states that depend on fossil fuel production. Just six states saw drops in inflation-adjusted tax dollars in the fourth quarter of 2017, the fewest since the second quarter of 2013. Despite the unusually strong performance at the end of last year, state tax revenue—like the U.S. economy—has grown slowly and unevenly since the recession. Throughout much of 2016 and 2017, collections were stymied in certain states by sagging energy and crop prices, and nationwide by weak wage growth. More broadly, consumer spending has been migrating toward services and online purchases that are less likely to be taxed. Looking ahead, the federal tax cut passed in December incorporates a range of changes to federal tax exemptions, deductions, and credits that could carry over and trigger changes in state tax collections. Some states have altered their tax codes in response to federal action. Over the past 10 years, the number of states that have regained their tax revenue levels has risen and fallen, reflecting volatility in state tax collections as well as tax policy changes. 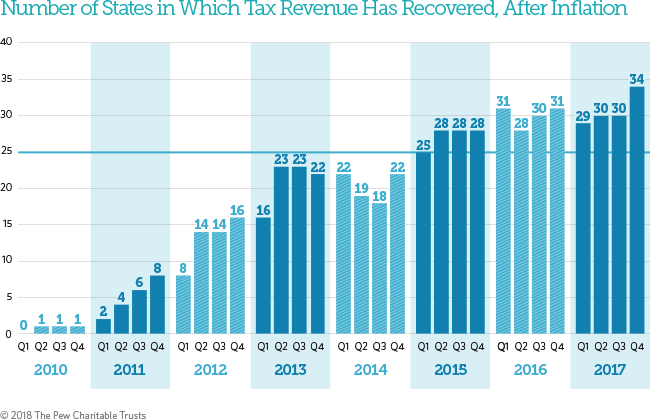 Nationally, tax revenue recovered from its losses in mid-2013, after accounting for inflation. But individual state results have differed dramatically depending on economic conditions, population changes, and tax policy choices since the recession. In 2010, North Dakota was the first state to surpass its recession-era peak, followed by Vermont, then Arkansas and New York by mid-2011. Tax receipts were above peak in 16 states at the end of 2012; 22 states at the end of 2013; 22 states at the end of 2014; 28 states at the end of 2015; 31 states at the end of 2016; and 34 states at the end of 2017. The most recent state to recover was Arizona, at the end of last year. State policymakers also have contributed to revenue trends, enacting tax cuts in states such as North Dakota and Texas and hikes in states such as Louisiana and Washington. According to the National Association of State Budget Officers, states in the past three fiscal years have enacted more tax increases than cuts overall, while doing the opposite in fiscal years 2014 and 2015. State budgets do not adjust revenue for inflation, so tax revenue totals in states’ documents will appear higher than or closer to pre-recession totals. 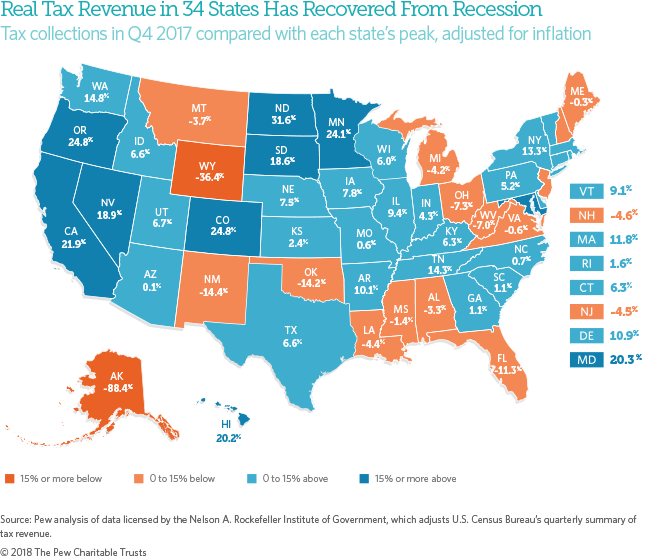 Without adjusting for inflation, 50-state tax revenue was 25.2 percent above peak and tax collections had recovered in 47 states—all except Alaska, Oklahoma, and Wyoming—as of the fourth quarter of 2017. Unadjusted figures do not take into account changes in the price of goods and services. Analysis by Barb Rosewicz and Daniel Newman. Quarterly revenue is adjusted for inflation and smoothed using a four-quarter moving average. Comparisons are based on each state’s peak level since 2006 to capture the effects of the Great Recession. Tax revenue in Michigan and New Hampshire actually peaked before 2006. Note that quarters are labeled by calendar, not fiscal, year. The data include revenue effects of legislative tax changes, so revenue increases or decreases may not be attributable solely to the economy. Results for Florida, Illinois, and Virginia reflect several years of newly revised data from the Nelson A. Rockefeller Institute of Government. The revision altered Virginia’s peak revenue quarter since the first quarter of 2006. Data may change further in future updates pending revisions by the U.S. Census Bureau and the Rockefeller Institute. Pew’s analysis is based on data provided under license by the Nelson A. Rockefeller Institute of Government, which includes adjustments and corrections the institute made to the U.S. Census Bureau’s Quarterly Summary of State and Local Government Tax Revenue. Data are adjusted for inflation using the U.S. Bureau of Economic Analysis’ Implicit Price Deflators for Gross Domestic Product, accessed April 3, 2018. Pew calculated the percent difference between each state’s quarterly tax revenue and its peak level since 2006, after adjusting for inflation and smoothing out seasonal fluctuations using a four-quarter moving average. Data are drawn from the U.S. Census Bureau, as adjusted by the Nelson A. Rockefeller Institute of Government to account for missing or imputed Census Bureau values. Pew adjusted for inflation using the U.S. Bureau of Economic Analysis’ gross domestic product implicit price deflator. Because of those adjustments, peak and low quarters in this data may not align with high and low points in some states’ tax collections in actual dollars. Notably, Pew’s post-2006 peaks for revenue in Arizona, California, Kentucky, Maine, Michigan, and Montana differ from their quarterly peak in unadjusted dollars by more than a year. Total tax revenue reflects taxes, and licensing and compulsory fees collected by states. The Census Bureau defines taxes as all compulsory contributions exacted by a government for public purposes, except for retirement and social insurance assessments and unemployment compensation taxes. State governments report data for more than 25 types of taxes including personal income, sales, corporate income, motor fuel sales, motor vehicle license, and severance taxes. For more details on the definition of tax revenue, see the methodology from the Census Bureau.